Hood and bumper painted which dont match so has to get repainted and blended. Also did an S3K set-up w/ external mani. But...... found out during the install my wastegate was leaking so now i've been waiting 2 weeks and counting for my tial 38mm to come in so i can get this bad boy tuned already! SlowK and Strongsilver like this. I just touched up the paint on my hood vents, and installed a volt gauge and oil pressure gauge. 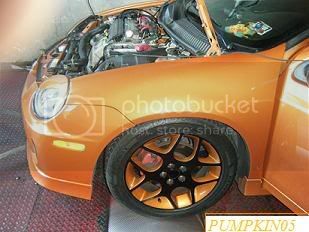 Also currently in the process of painting my extra set of stock rims black and orange. Turbotronic and SlowK like this. I am starting to freak out about how many people on this board are grammatically challenged. Write some half decent sentences so people don't need to spend more time finding out what you're saying. nothing.been sitting in the garage for 5 days now..
next week: finally ready to install my brand new AGP stage 3 delta 44 turbo kit!! almost all the supporting mods are in place! Deleted a bunch of vacc lines to clear up engine bay. And need to change spark plugs. Over the weekend, I threw on some sound deadening material (B-Quiet Ultimate) on all the doors, under the rear seat cushion, and the trunk. I'll do the floor area plus add some Luxury Liner Pro to help quiet the vehicle down even more whenever I have the time.